The fresh, sweet aroma of Organic Whole Lavender Flowers has relaxing and uplifting qualities that leave users with a sense of calm and balance, making it one of today's most popular scents. Lavender is a gentle, multi-purpose herb. Use in herbal sachets, DIY creams and lotions, shampoos, facial steams, baths, body powders, salves and body mists. Our lavender flowers are also safe for consumption. Try them as a tea, add them to flower-infused cocktails or use them to flavor kombucha. 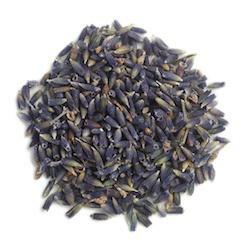 Lavender flowers have a fresh, sweet, floral, herb-like aroma. The flowers are harvested when in full bloom, usually being stripped from the flower spike, but sometimes dried on the spike to make lavender flower wands. Lavender flower petals are fused together in a tubular shape and the color of true lavender flowers is a grey-blue. Directions: To make tea, pour one cup of hot water over 1 teaspoon of organic lavender flowers and steep 3 to 5 minutes.